The Black Friday is coming - what does it mean? We're going to spend lots of money, it's an ideal time to buy presents (unless you don't order them from other countries, that isn't always possible) but still, lots of brands and online shops have good deals. I'll share with you some of my recommendations and tips what is worth a buy and how to choose ideal products for your skin. I'll also share with you my wishlist and some codes to use. What is worth buying during the Black Friday? It depends on your personal choice, I think that Black Friday is a good way to save some money. A year ago I bought the whole skincare set that was based on Klairs product and it was worth it. This year I'm pickier, I've got a wishlist where I upload prices every month and if I need for example new cleanser and the cleanser on my list is in a good price then I'll get it. I'm trying not to be "emotional" while buying - it's not worth to buy a product just to buy something cheaper. Actually, we should invest in a skincare which works with our skin, obviously, it's hard to check that through the computer that's why we've got ingredients lists and websites like Skincarisma which is my favourite website to check the product, I might not be always 100% fine with the results but it might be a big help and if you set an account where you can set some alerts related to the ingredients that don't work with your skin well. Online reviews are also good but as you know - what works for you, it might not work for me - every skin is different and even if the product is recommended to - for example - acne-prone skin it might not work on your skin. So to sum up - buy only things that you might actually need and that you really want but firstly check ingredients. It's good to compare prices of the products before buying them. Instead of buying another mask I would choose ingredients that can really help your skin in winter or even in other seasons. Depends on your skin needs you might focus on different ingredients. If you need to restore your skin barrier then I would choose Centella Asiatica, Madecassoside, Ceramides, Hyaluronic Acid or Glycerin. If you have a problem with acne then Tea Tree Oil, Centella Asiatica, AHA&BHA acids, Zinc Oxide, Niacinamide, Willow Bark Extract, Wild Rose Oil, Tamanu Oil or Green Tea Extract. Pigmentation is quite hard to focus on but if you have problems with it then AHA & BHA acids, Niacinamide, Arbutin, Adenosine, Licorice Extract, Vitamin C or Vitamin A (even if I'm not a fan of Vitamin A in a skincare product) might be a choice for you. If you want an anti-ageing product then choose products based on antioxidants like green tea, EGF and FGF factors, Adenosine, Arbutin, Niacinamide, Vitamin A, Vitamin C+E, AHA acids or ceramides. There's a bunch of series worth your attention but in my opinion, some of the series and brands are really worth a try. Klairs - Vitamin E mask + Vitamin C serum. This combination works even better together so I do not see the reason to separate this perfect duo. Dr.Jart+ - Ceramidin series. You can love or hate this brand but the Ceramidin series is a winter must have since ceramides are very important in the process of restoring skin barrier. Swanicoco FGF Ampoule - I'm in the middle of testing this product but I can see the results and it's definitely a must-have for every person with post-acne scars or wrinkles. By Wishtrend - Green Tea Enzyme Powder Wash and Mandelic Acid 5% Skin Prep Water - this brand has surprised me a lot this year and both products are worth a try, the ingredients are really good. La Roche Posay Cicaplast - another ideal series for Winter and skin barrier. Deciem - this brand made The Ordinary and NIOD. Depends on the line, the product is cheap or expensive, no matter which one you want to test, Deciem is definitely a brand that is worth your interest. There are some things that you should remember while shopping. Remember to check shipping prices and taxes - just in case, if you order from a foreign country. Shipping options like DHL, K packet, EMS, etc - sometimes choosing options like DHL = additional costs + taxes. Check if the product has long expiry date, some shops are selling product with a short expiry date for cheaper prices during the Black Friday. The first item on my wishlist was a Wayskin device, it's a wearable device. It connects with an app on your smartphone (iOS or Android) and it helps with tracking the behaviour of your skin like hydration or how the skin is reacting to new cream. In EU, this product is available only on SkinID and it costs around 170$, while on Glowrecipe this device costs 80$ + shipping. The price range is different, but usually, I see prices between 80-200$ depends on the website. I've decided to get it from SkinID for less than 1200kr since it's the safest option - it's a Swedish store and it's easier to order it from Sweden than from US - taxes, etc, I think that no matter where I would order it from Glow Recipe or any other website it'll cost me around 1200kr anyway. The other thing on my lists is Dr.Jart+ Ceramidin series. This series is based on ceramides, they can actually help with restoring the skin barrier and for me, winter is an ideal time to focus on skin barrier. 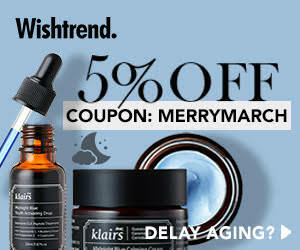 I might actually buy Klairs Midnight Blue Calming Cream or Klairs Midnight Blue Youth Activating Drop. I had cream before, it contains Centella and I like to use it on dry parts of my skin or on inflamed spots. I bought this cream year ago and I'm almost out of it so it's good to get a backup. I haven't tried Drop Serum but it contains EGF factor which is quite a controversial ingredient and I might actually get it to try it, I'll probably read something more about EGF factor and then decide. I've got some brands which I might try to get some product from like Primera or Make P:rem - mostly cleansing and sunscreens, eventually creams or sleeping masks but I also do not plan to spend too much, if I'll find a good offer then I might buy some product but if not - I won't spend money on them. JJKoreanBeauty- up to 70% off. I'll try to update the code list later, let me know what do you plan to get on Black Friday and do you have any beauty wishlist?